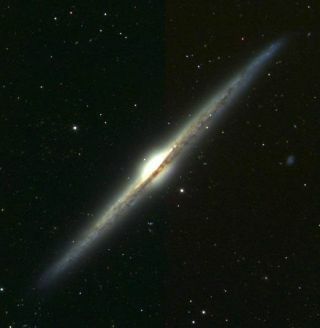 Spiral galaxies seen edge-on often show dark lanes of interstellar dust blocking light from the galaxy’s stars, as in this image of the galaxy NGC 4565 from the Sloan Digital Sky Survey (SDSS-II). The dust is formed in the outer regions of dying stars, and it drifts off to mix with interstellar gas. The new analysis of quasar colors shows that galaxies also expel dust to distances of several hundred thousand light years, ten times farther than the visible edge of the galaxy seen in this image. The thin haze of intergalactic dust dims and reddens the light from background quasars. The vastspaces between galaxies might seem pretty empty. But they are actually litteredwith clouds of cosmic dust that were likely ejected from the galaxiesthemselves. And the dust scatters farther into intergalactic space thanastronomers expected, a new study finds. Thediscovery was made by watching subtle shifts in the light emanating from radiosources that sit at the hearts of far-away galaxies. These radiosources are called quasars, and are the most distant and powerful sources ofenergy in the universe. From their nests at the centerof galaxies, they emit powerful jets of radio waves, X-rays and sometimeshigh-energy gamma rays. Like celestial flashlights, their light can penetratethrough the dark expanse of space. On its wayto Earth, the light from quasars passes by and through intervening galaxies.Dust grains in the galaxies block the light from the blue end of the spectrummore effectively than red light, causing a quasar to appear redder to viewerson Earth. This samephenomenon can be seen on Earth during a sunset: "Light rays pass througha thicker layer of the atmosphere, absorbing more and more blue light,causing the sun to appear reddened," said Ryan Scranton of the Universityof California, Davis, who was part of the team that made the dust discovery. "Wefind similar reddening of quasars from intergalacticdust, and this reddening extends up to ten times beyond the apparent edgesof the galaxies themselves," Scranton explained. The teamanalyzed the colors of about 100,000 distant quasars located behind 20 milliongalaxies, using images from the Sloan Digital Sky Survey (SDSS-II). "Averagingover so many objects allowed us to measure an effect that is much too small tosee in any individual quasar," said team member Gordon Richards of Drexel University in Philadelphia. The lightshifts showed that dust wasn't just in the galaxies, it was also outside ofthem. "Galaxiescontain lots of dust, most of it formed in the outer regions of dyingstars," said team leader Brice Menard of the Canadian Institute forTheoretical Astrophysics. "The surprise is that we are seeing dusthundreds of thousands of light-years outside of the galaxies, in intergalacticspace." Supernova explosionsand "winds" from massive stars drive gas out of some galaxies,Menard explained, and this gas may carry dust with it. Or, the dust may bepushed directly by starlight. "Somehow,some of this dust is getting ejected into the space between the galaxies,"Richards told SPACE.com. Astronomershad thought that any dust spewed out by exploding stars would fall back intothe galaxy, like a baseball falls back to Earth when it's tossed in the air. Thedusty material must be jettisoned much faster than scientists had thought toovercome that gravitational pull, just as a rocket must be launched at veryhigh speeds to reach space, Richards explained. So the newfinding means that astronomers will have to "start tweaking theoreticalmodels," to see if they can come up with a mechanism that explains thedust clouds surrounding the galaxies. Thisintergalactic dust could affect planned cosmological experiments that usesupernovae to investigate the nature of "dark energy," a mysteriouscosmic component responsible for the acceleration of the expansion of theuniverse. "Justlike household dust, cosmic dust can be a nuisance," Scranton said. "Our results imply that most distant supernovae are seen through a bit ofhaze, which may affect estimates of their distances." Thefindings were submitted to the journal Monthly Notices of the Royal AstronomicalSociety and posted on Feb. 26 to arXiv.org, an open-access Web archive forpreprint articles in the fields of physics, math and computer science.